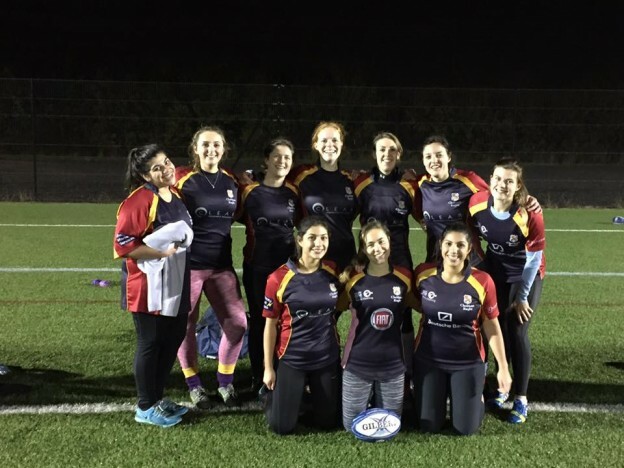 Match Report from Zarah Alam : Last night the Chobham Woman’s Touch Squad played in the London Irish tournament with the most “profound intent to win”! It was so cold that some ladies lost feeling in their hands, the fog was so strong that we couldn’t see half the pitch, and though we did not win one tap off, we had the most brilliant tournament we have played! We started the night against G-Force. This game really set the standard for the rest of the night as though we drew at 0 all, it was a sign for us that our newly learned defense held strong. With no break, we ran to the next field to start our second game against London Irish Diamonds who we beat 0-1. Our first try of the night! After a 25 minute break in the freezing cold we attempted to stay warm and focus for our next game against London Irish Emeralds. After 1 try being scored against us in the 1st half, we dug deep to score 2 tries in the second half winning 2-1! With only 1 try against us in the whole tournament so far we faced perhaps the strongest team of the night, The Rats. We fought an amazing fight and though we did not win this round, the score was only 0-1 to Rats – because one of their girls can run faster than light. This in no way changed our mind frame as our last game was against Grasshoppers. Every single lady left it all on the field as some of them played their last game for the year. We did nothing but dominate the game winning 4-0.